Is Growing Orchids for You? 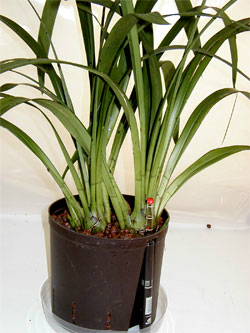 Repotting Cymbidiums - transplanting into hydroponics - is well worth the effort. In nature, cymbidiums grow on rocks and trees with their roots exposed to the elements. Correct watering can be difficult when growing in a pot. Because overwatering is a common problem, many cymbidium growers use potting materials that don't hold water and drain quickly. Then, if you're not careful, underwatering can even be an problem! Our Hydroponic System makes correct watering easy. A water gauge tells you when to water (or WHEN NOT TO WATER!). The best place for growing Cymbidiums is outside. Our hydroponic system has many advantages for outside growing too! It's those remarkable clay pebbles. 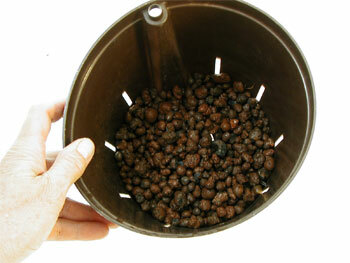 Clay pebbles (called LECA) replace all other potting materials in our system. 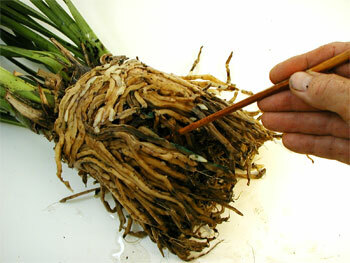 Finally, cymbidiums generally need to be repotted every 2-3 years because because the growing media breaks down. Replacing exhausted growing media is a chore and disturbs the plant. The growing media in our Hydroponic System never breaks down - less repotting! The best time for transplanting cymbidiums is late spring or early summer - just before taking them outside for the summer. First, remove the dead flower stems. 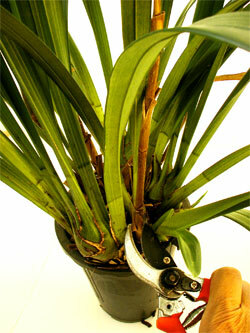 Using a sharp pruners, cut the flower stem off at the base of the plant. 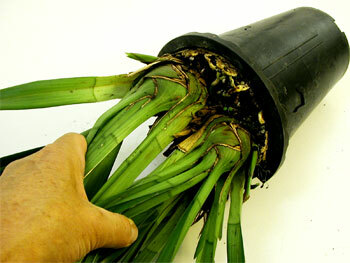 Cymbidiums like to be crowded in the pot so removing the plant from its existing container can be a chore. Gently tap the pot with a hammer to loosen the roots. Notice the large, complex root system. Removing the existing growing media can take some time. Soaking the rootball for a couple of hours (or overnight) will make it more cooperative. 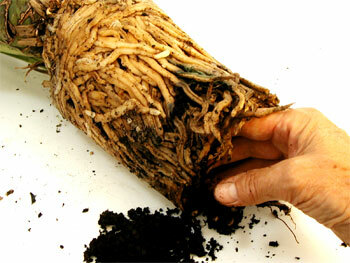 Tip: I've learned that tearing the roots apart just to get that last bit of bark or moss isn't necessary. These plants have no problems adapting to hydroponics even if you leave some planting materials behind. Pull roots apart wherever possible. Be aggressive. Dig in with your fingers. Keep digging and pulling. If you hear a snapping sound, a root broke so back off a little. Chop sticks make excellent tools for poking around between the roots. Wash away all bark and moss between the roots. You're going to need a garden hose for this. Water from the tap just doesn't have enough pressure to get in between those thick roots. Sometimes cutting the rootball is the only way to get inside. 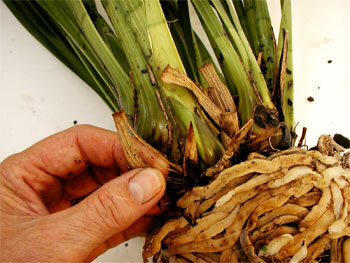 Using a clean, sharp knife, remove all decaying roots. 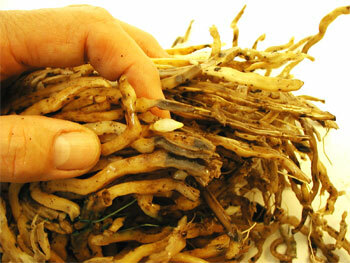 Healthy roots are white or pale yellow in color and firm. Brown, soft roots are rotted - remove them. Some root loss is normal. 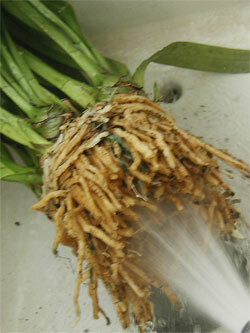 Be aggressive - new hydroponic roots will grow back quickly. Careful! A white tip at the end of a root is an active growth. Don't damage new growth tips. Back to the sink for more washing. Notice the smaller root ball this time around. Now is a good idea to remove the sheaths around the psuedo bulbs too. Insects like to hide behind them (most likley scale). Choose a culture pot that allows for 1-2" of room all sides. Cover bottom of culture pot with pebbles. Postion plant and fill with pebbles. Tap down pebbles. 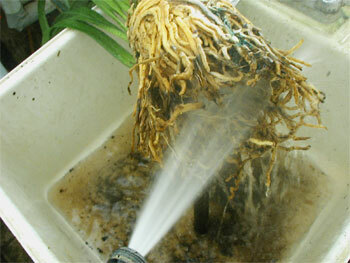 Be aggressive, don't leave any air gaps around the root system. Here's our new plant. As you can see, we're not using an outer pot. This plant is going outside for the summer so a shallow plastic saucer replaces the outer pot. The decorative outer pot will collect too much water from rain showers outside. See Growing Outside for Summer for more on this. 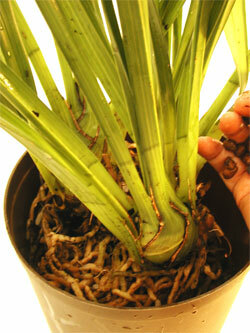 Cymbidiums like to be crowded so repot into a larger pot only after culture pot has burst. With Hydroponics, the LECA pebbles will never decay or breakdown so repotting simply to replace old growing media is unnecessary (big advantage!). With Hydroponics, when it's time to move to a larger pot, simply remove the plant from its old culture pot and transfer the entire root ball to the larger pot. 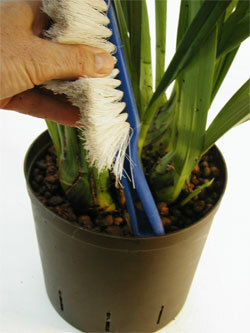 No need to disturb the plant by poking around to remove old potting materials. The (LECA) clay pebbles inside the root ball are as good as new!